Each week in the newsletter at work, they do a short profile of someone working on the project. Just a few questions, like “What’s the last book you read?”, “What’s your favourite place you’ve ever visited?”, and “If you could have dinner with someone, alive or dead, who would it be?” A few weeks ago, they did my profile and my answer to that last question came to me immediately: My dad. He’s been gone six years now, and I really wonder what he’d think of all the things going on in the world these days. I wonder what he’d have gotten up to in his retirement years. He’s been gone six years now, and I still think of him all the time. When I was fixing something around the condo, I was thinking about how he taught me how to use a screwdriver; when I shot two pucks just over the net in my game on Wednesday, I just wanted to call to tell him about it because I know he’d understand the mixture of pride (I lifted the puck that high!) and frustration (so close to scoring, but yet so far! ); when I avoided a collision the other day on the way home from work when someone tried to change lanes without looking at their blind spot and so just swerved right at me, I thought both about how he’d taught me to drive *and* that I was screaming at the other driver just like he would have been. Six years gone now, but never forgotten and always loved. 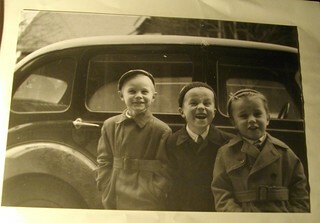 My dad and two of his brothers (Bob and Greg).